As always there have been lots of successful Hollybrooke ponies this year. 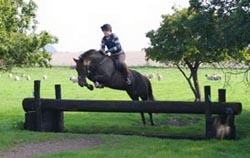 Many of our ponies are now producing very creditable performances under saddle. It was our intention to breed sports ponies when we first started the stud and it is lovely to see them out successfully competing. Hollybrooke Maxwell has been impressive this season competing at BE 80. His dressage scores have been consistently in the twenties and he has followed this with bold jumping displays achieving double clears and some excellent results. His rider Janine Paterson feels he will be ready to tackle BE 90 next season. 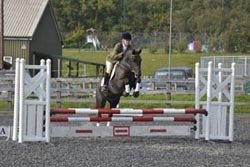 Along side this he has competed in some flat and WHP show classes with equal success. 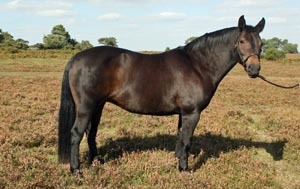 He has been well placed in several HOYS flat qualifiers and won the novice WHP class at the Breed Show qualifying for the NPS Championships next year. Another two ponies who have shown scopey and bold jumping ability this year are the full sisters Hollybrooke Brown Sugar (left) and Hollybrooke Martini (right) both by Burley Branston out of Crabbswood Sherry. 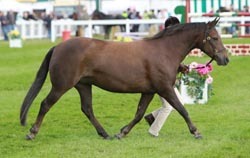 Having sold Hollybrooke Jubilee after she had won on both her showing outings at the beginning of the season. 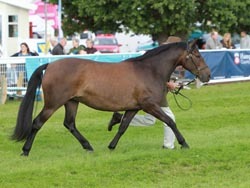 The only other young pony we had left to show was Hollybrooke Rambler's three year old daughter Hollybrooke Grace. She went to six shows and won three times and was reserve champion twice. We plan to break her next year and she will have a ridden career before becoming a brood mare. Her half sister also by Rambler, the four year old Hollybrooke Nutmeg was backed this summer and is already out winning rosettes in Intro dressage. 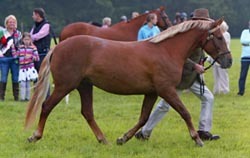 She has a lovely temperament and is going to be a high quality show pony. Unless she has been sold, she will contest ridden classes next year. The highlight of this year has been the success we have had in mare classes. We won the small yeld mare class at the New Forest Show, the best small yeld mare and the mare championship at the Breed show and we also had the best mare at the annual New Forest mare grading. The three wins were amazing but to do it with three different mares was quite spectacular. Hollybrooke Ruby pictured left (Hollybrooke Rambler's full sister) started the success by winning the small yeld mare class at the New Forest Show. Hollybrooke Melitta was third in the same class. These were amazing placings as there were twenty eight mares entered many of whom had serious show winnings to their credit including a previous breed Show supreme champion and this year's reserve supreme. At the Breed Show it was the turn of Melitta pictured right. She swept the board by winning the young small yeld mare class, the cup for the best overall small yeld mare and then the mare championship beating the eventual reserve supreme pony of the show. Sparkle and Ruby were second and third in the senior small yeld mare. Then came the mare grading where we took two mares. Hollybrooke Ruby and Hollybrooke Sparkle. Ruby was well placed in third but Sparkle, pictured below was the highest scoring mare, a massive ten marks better than her closest rival. 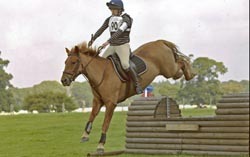 In 2007 when she was three years old Sparkle, on the left gave us our first ever New Forest championship. Since then twelve different ponies shown and bred by us, have won forty championships twenty six in hand and fourteen ridden. They have also won two reserve supreme championships and four supreme championships. Not bad for a small stud that set out to breed performance ponies!